I am not a big fan of shopping. I suppose most of you aren’t either. I just don’t like to spend endless hours roaming around shopping malls. I used to buy clothes in a way that I enter the store, see what I like, try it and buy it. That was just my way of doing things, but this way of shopping is not good if you want to build a suitable men’s wardrobe. In the last few years I have changed this routine and now I target my shopping. I buy only things that I need. Clothes that I will be able to combine with other clothes in my wardrobe, and I try to buy quality stuff that will not wear after a year or so. This article will try to explain how to buy clothes that you need. How to buy clothes that will compliment other clothes that you have and how to build a suitable gentleman’s wardrobe. ©Rose & Born, Sweden. 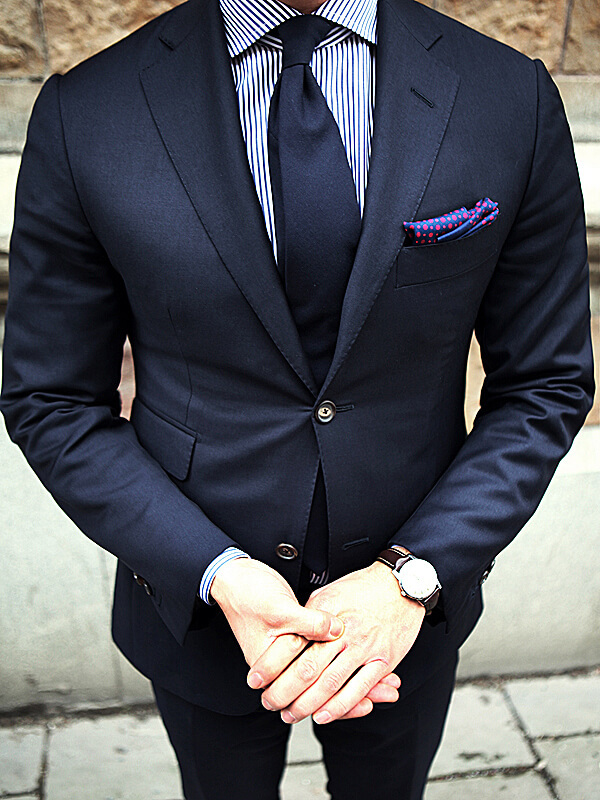 Navy blue suit should be in every man’s wardrobe. When it comes to building a gentleman’s wardrobe, there are a lot of things to keep in your closet, so you can be prepared for anything at a moment’s notice. Suits – navy blue and gray. It does not matter if you have to dress up for work or not, you will need these suits, they are the essentials. Jackets/blazers – invest in few good ones that you can wear with suit pants, jeans, over sweater… You can go with patterned or solid ones. It depends on your style. I prefer Glen plaid and windowpane patterns. Shirts – You should have at least 5 dress shirts, one for every working day in a week. Few white ones and few pale blue ones. You can also include one or two black ones. They can go nicely with a gray suit. If you like patterned ones, go for striped shirts for a start. They are more business wise than the ones with checks, but if you prefer checks, go for gingham check. It is versatile pattern, since you can wear it in business and casual occasions. Also get yourself several custom shirts. These ones can be more patterned. Gingham checks, Madras patter or tartan ones if you like it. But first start with dress ones. 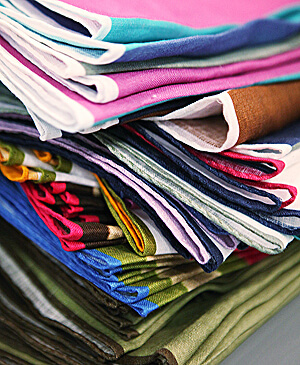 Ties/pocket squares – buy yourself a few solid color silk and woven ties. Also buy few pocket squares. Silk and linen ones. When matching tie and pocket square make sure that they are not from the same material, for example don’t wear a silk tie and silk pocket square. Coats – same rule applies as with suits and sweaters. Go for quality. Good coat will serve you for years. Buy classic looking coat, or you can buy pea coat. Duffle coat is an option also, but I don’t like them. If you can afford it get yourself good trench coat. Straight leg dark jeans – you can wear them with your shirts, suit jackets, black shoes, sneakers, whatever. Everything goes with jeans. Length of the jeans can be a bit longer than your suit trousers. Gray sweater – goes well with jeans, suit trousers or jacket, you can wear a white shirt underneath it… Invest in quality stuff, from wool or cashmere. Don’t go for cheap ones, because they will shrink after a few washes. © Richard Anderson, Savile Row, London. 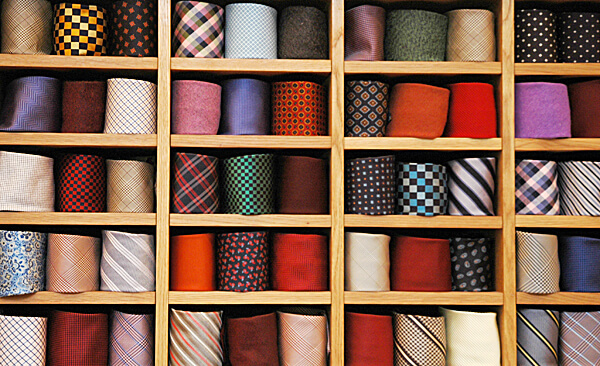 You can never have enough ties. Try to make a list of things that you need and the things you would like to have. Make yourself a priority for the upcoming season. If the winter is approaching maybe you need a new pair of gloves and scarf. Maybe new tweed suit. Stick with what you need and buy that stuff first. You might be tempted to get a pair of shoes because they look nice, but a new suit may be a better investment if you’ve been cycling between them for a while and they are starting to get worn. 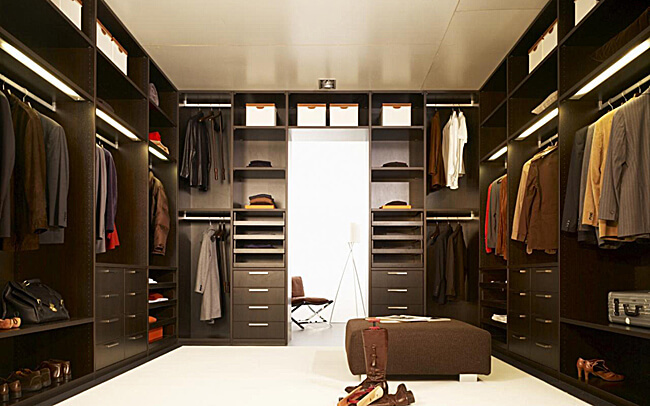 Keep track of the items you need, or items that need to be replaced, in your gentleman’s wardrobe. This doesn’t mean you can’t buy anything strictly because you want it – as long as you make sure you have everything you need before indulging. If your budget allows it, treat yourself with something that you wished, but have a plan. There is no point in buying clothing items that you cannot pair with anything you already have. © Michelozo – Men’s Custom Dress Shirts; Having several white shirts is a must. After you make yourself a list, make yourself a budget. If you don’t know how much you should set aside, then do a little research. Find some gentleman wardrobe brands that you like the look of and find out their average prices. See how much you can spend on clothes that you need. In the beginning, buy less. Buy smarter. Check out the prices in several stores. Don’t enter one store and buy instantly. Take your time and be patient. Visit several stores and compare prices. Have a plan how much to spend on a suit, how much to spend on a coat, how much to spend on accessories. If the sale season is coming, wait and maybe you can buy some quality stuff on the sales. © Rose & Born, Sweden. You can never have enough pocket squares either. It is better to have three suits of great quality that you can wear for years than to have seven cheap ones that will wear off in a season or two. Yes, quality costs more but in the long run it will become cheaper. This is true especially for the shoes. I have bought many number of shoes that cost around 100 EUR (130$) that lasted not more than a year or two. Since most of them are not stitched but glued they will tear more easily. If you buy few necessary pairs that have great quality, with good care, you can wear them more than 10 years. You don’t need to buy branded shoes. 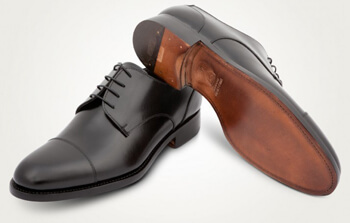 The cheapest option is to visit some of your local shoemakers and maybe they can make you made to measure shoes that you need. It will cost you cheaper and you will get what you want. In the end you will be more satisfied. Buy clothes that fit you. If you have gained some weight and you plan to lose that weight and get back to your normal size then postpone shopping for later. Don’t buy something that fits you now and in two months you will lose 10 kg. Then it will be too big and you wasted your money. Also do not buy things that look good but don’t fit your silhouette. Don’t follow fashion, follow your style. 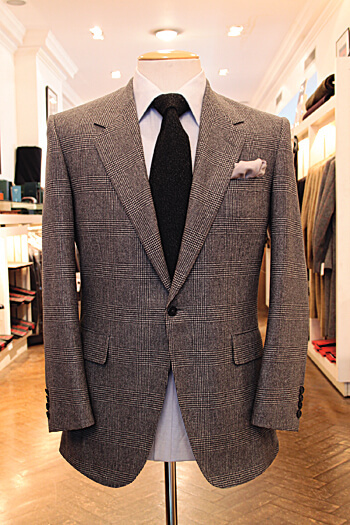 If some things do not fit perfectly maybe you can alter it easily at your tailor. Fit also goes hand in hand with quality. If something is of good quality it will keep its shape unlike the cheap stuff that can stretch or shrink with time. Having a wide array of accessories in your closet is a great thing. They add that extra touch to your style. The good thing about accessories is that you can sometimes buy some cheaper stuff, but for the things you like you will have to invest a bit more. I for example always wanted to have driving gloves. Since I wear them a lot during colder days I bought good quality gloves that cost much more than some cheap ones. I knew I would wear them a lot and I want them to last. Sometimes you can buy cheaper stuff that you will wear a season or two. Cheaper scarves, pocket squares, ties. These are the things on which you can save some amount of money and invest it in some more important clothing pieces. Black and brown shoes are a must. Sales are good because sometimes you can truly find quality stuff for small amounts of money, but sales can be one big trap. A trap in which you can fall easily and spend lots of money on stuff you don’t need and will wear only once or twice. Women are experts in this field. Don’t fall into this trap. It does not matter if something has killer price, but if you don’t need it, don’t buy it. Stick to your plan and goals. If you find something that you really need on the sale, then great, buy it, otherwise don’t buy something just for the sake of buying things because they are a bargain. Fashion is big business. It changes from season to season. Maybe you thought that those black leather pants are so cool, but next year you will throw them away because they look ridiculous. Styles are always changing – one minute something is popular and the next minute everyone acts like they never heard of it. Stick to your own style when building a gentleman’s wardrobe and you won’t have to worry about the changing tides of style as much. You can look for inspiration in other man, but do not follow their style blindly. Build your own. Fashion is season long, style in a gentleman’s wardrobe is eternal. © Richard Anderson, Savile Row, London. Invest in few good quality sports jackets and blazers. It will take time before you find your own style. Start small. Buy cheaper stuff and try them out. See how you feel in them. Do you look good in them? Do other people compliment you on your style? Do you feel comfortable wearing it? When you find stuff you like, start investing in more expensive, better quality stuff. This process is long and it will take years to develop your own style. Trust me, your views on the world are not the same in late 20’s and in late 30’s. Try to dress in a simple manner. I am not going to tell you how to dress and which things to buy. If you prefer more dandy style, then go for it. If you are more of a classical man, than buy classic clothes. Whatever your style is you should have several simple clothing items in your wardrobe. Several white shirts, few black ones, pale blue ones, gray suit, navy blue suit, black and brown shoes. Those are the cornerstones of every wardrobe. Build upon them. Then you can combine them with other stuff. Navy blue jacket with jeans and brown shoes. That’s one combination. These simple, must have items you can combine in many ways. If you cannot afford some things don’t bother yourself about it. Do not become frustrated or obsessed with clothes. It should be fun. If you can, save some money on the side for future shopping tours. You don’t need to buy everything now. Besides, it takes time to build great wardrobe. Rome wasn’t built in a day, either. Denim Jeans, a Yes or No for the Modern Gentleman? 4 Comments on "How to Build Essential Men’s Wardrobe"
Beauteologie website has a wonderful article on men wardrobe essentials with lots of examples and links to suggested item! So useful! Great article, am delighted to have found this blog. Thanks a zillion. I’m so greatful that I have found this blog. It is really what I needed, and I’ve going through it giving an immense feeling that I should change my wardrobe.